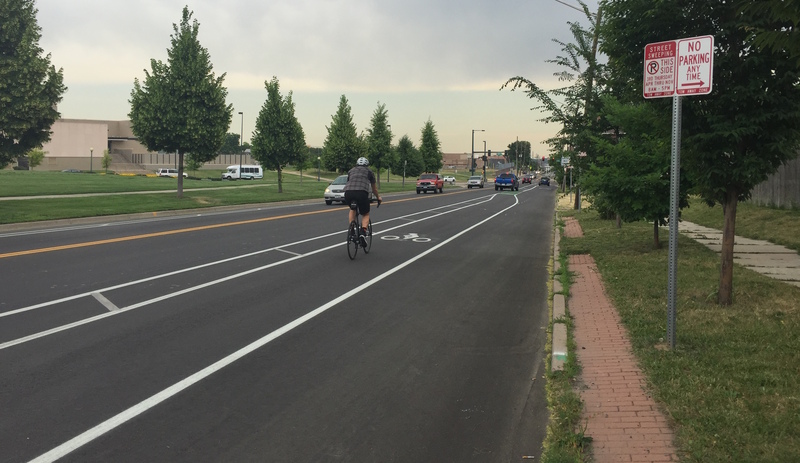 Denver Public Works recently striped some much-needed bike lanes along West 29th Avenue, as well as a small portion of 15th Street in Lower Highland. Much of the route is separated from traffic with a painted buffer. Along different segments of the corridor, the existing lane configurations were changed to accommodate the new bike lanes. For example, from Sheridan to Lowell, curbside parking was removed on one side of West 29th Avenue to make room to add the bike lanes. Between Lowell and Federal, enough space was freed up for the bike lanes by eliminating a center turn lane. Between Federal and Speer, the former condition was a mess of travel lanes, turn lanes, and striped islands that made for a confusing drive for motorists and a daunting experience for bicyclists. Now under the new configuration, it’s pretty simple: one travel lane in each direction for motor vehicles, a buffered lane in each direction for bicyclists, and curbside parking along the south side of the street. West 29th Avenue also received a road diet between Umatilla and Clay streets, where previously there were two westbound and one eastbound travel lanes. One of the westbound lanes was eliminated to squeeze in the new bike lanes. However, in the process, West 29th Avenue picked up a new curbside parking lane between Umatilla and Zuni that hadn’t existed before. The 29th Avenue bike lane plugs a significant east-west gap in the city’s bike network. 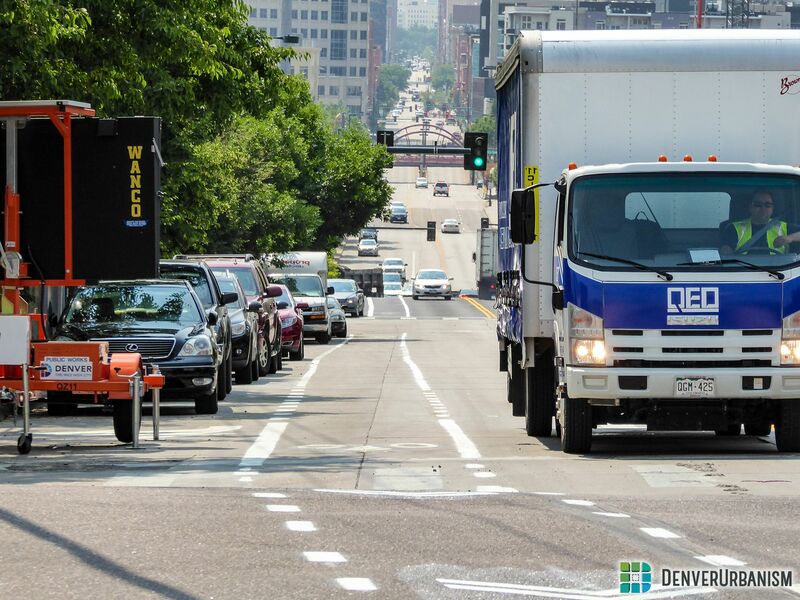 On 15th, the striped bike lane is a step toward a safer route between the end of the protected bike lane downtown and across the Platte River and I-25 into Lower Highland. Still, painted bike lanes are what Public Works considers “moderate ease of use” — they’re not as welcoming and easy to use as protected lanes. The department’s stated goal is to have every Denverite live within a quarter-mile of “high ease of use” bike infrastructure. Additionally, as Schroeppel notes, Public Works apparently could not find room for a southeast-bound bike lane on 15th — just a northwest-bound lane. This project is one of a handful of new bike lanes planned for this year. Public Works will build a parking-protected bike lane on Stout Street, a buffered bike lane on Champa Street, and upgrade the 14th Street bike lane with a curb that separates it from traffic. I’ve been riding 15th/29th at rush hour for years, and the new bike lane is an astounding difference. I’m still a little concerned about traffic turning right across the bike lane (I was narrowly missed just last night by someone turning right from 15th onto Boulder St.). So far, the right turn traffic at Zuni and Speer has not been dangerous–I was particularly worried about Zuni, as the majority of dangerously aggressive drivers I encounter turn right there (what’s up with that, ragey folks? You all live in the same ‘hood??? ), but I think the parking to the right of the bike lane prevents cars from cutting into the bike lane–there just isn’t room for them to cut the line without damaging their car. I don’t know if that was intentional, but it’s a design that works surprisingly well. On the other hand, I am now regularly seeing people park in the bike lanes, forcing bikes into the now narrower car lane. We really need some serious enforcement here and in front of Union Station, where it’s ludicrous. More door squish zone. Yay. Cars are still a priority. Welcome to 1997.